For New Year’s Eve this year we kept things fairly simple and had a few friends over for a meal, drinks and board games. It was such a lovely, relaxed way to bring in 2018 and I really enjoyed myself. We cooked a meal for our friends and, if I can say so myself, it was really delicious. To start with we had some ‘nibbles’ – a selection of crisps, dips, vegetable crudités and olives. Then it was onto the main, where we had a pork joint served with onion gravy, roasted potatoes and vegetables. Then, it was onto my favourite part of the night – the dessert. 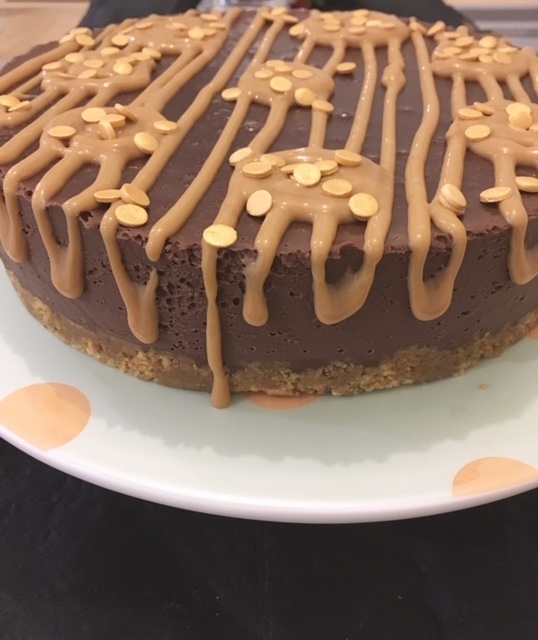 I made this BBC Good Food chocolate & salted caramel torte recipe and it was SO good. A buttery biscuit (I can’t not sing that in my head!) base, topped with a thick layer of caramel and a rich, almost bitter chocolate ganache. 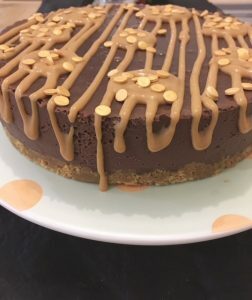 The caramel and ganache complimented each other perfectly and, although it was quite rich, it was also really addictive – I wanted to just keep eating. The recipe says to include some caramel chocolates on top, but as I didn’t have any I just left that part out, and I can’t say they were missed.